When you’re ready to take your business to the next level, it’s critical to learn how to market your products and services effectively. Without that knowledge, any leads you attract are flukes. -And converting them into paying customers? Forget it. However, the right marketing plan will work wonders for your profitability. It’s a long term process that requires effort – especially if you want to enjoy the best possible outcome. Rather than using one or two marketing strategies, use several. You’ll quickly see which ones work best for you and your target market. Also, keep in mind that consumer demands are always changing; you’ll need to adjust your approach accordingly if you don’t want to fall behind. So you’re tired of being a small fry; you’re ready to move up to larger fish. What do you do? There are a lot of actions a business owner can do to grow, we cover many of them here in our blog. 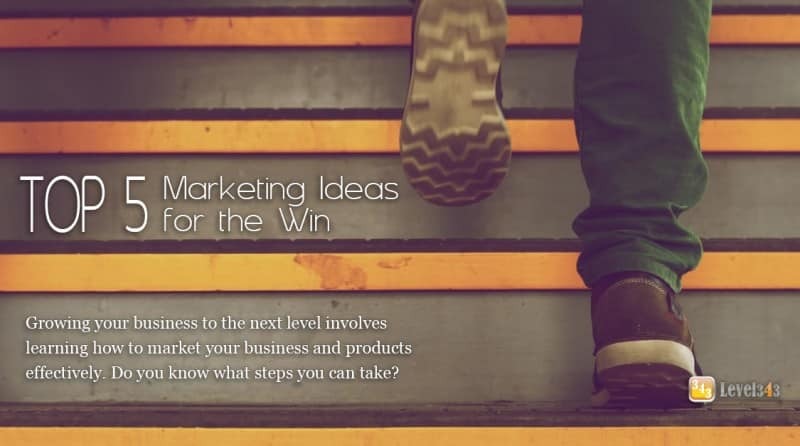 Below are the top five marketing ideas you can apply to your business for exponential growth. Some business owners put out a few flyers and hope they get results. That’s their marketing campaign. Some randomly create a few ads, maybe a website, and call that a marketing campaign. Even if they reach their goals, however, the results will be unpredictable. You don’t want predictable. You want to experience consistent success. At the start of any marketing campaign, there is the brainstorm session. You’ll need to brainstorm keyword ideas (think topic clouds), but you’re also required to research the profitability of each keyword you intend to use. In other words, how likely is it for people to search for that term, talk about that term, react to that term, etc. The plan that you create should cover the next six months of your marketing activities. If you do this step properly, you will bring in more leads than ever before. You can appeal to as many people as possible by using all of your online assets, such as images, videos, articles and white papers. Through it all, keep excellent customer service at the front of your mind, however. Once you get them in the door, the quality of customer service has a lasting impact on your prospects. In April 2015, Google released a search engine update that the SEO industry called “Mobilegeddon.” In short, there are search results on your desktop, and there are search results on your phone. Searching for the same term on both devices most likely will not give you the same results. Why? Because Mobilegeddon says if your site isn’t mobile-friendly, it shouldn’t show up on mobile phones. If you’re content isn’t mobile-friendly, you’re leaving a lot of money on the table. This is especially true if you own a brick and mortar shop; your business could even fail as a result. People now use their phones for almost everything; in addition to making phone calls, they surf the web, order food, contact taxi services and more. Ensure that all of your content and graphics are viewable from cell phones and other portable devices if you want to benefit from this change. Allow your prospects to make purchases from mobile devices and you will be impressed with the results. Whether you like it or not, almost everyone uses social media to stay in touch, to find entertainment and to remain updated on the latest news reports. Keeping up with the competition requires you to master social media and to use it like a beast. To get the most from your effort, you will need to automate as much of your social presence as possible, but you will also want to spend several hours each day to interact with your fans, users, eventually potential clients. This may include answering questions and responding to comments. No matter if you opt to use Facebook, LinkedIn or Twitter, you need to cover your social presence at all times. If you want to reach a large audience, use several social accounts to connect with your prospects. Each person you bring to your website or sales page takes time, effort and money. If you let your prospects walk away without asking for their contact information, you are throwing money away. The easiest way to stay in touch with your prospective customers is to build an email list, and doing so is not difficult. MailChimp and Constant Contact are just two of the autoresponders that are available to you. People, however, will be reluctant to give you their email address without a good reason. Try a monthly newsletter, offer content that is not available elsewhere, and with time, patience, and a keen eye on how you measure results, your list is bound to grow. Online marketing used to follow a certain set of rules. However, now that digital marketing has taken over your global reach, you have to incorporate so many disciplines. There are so many ways to build a marketing campaign – so many avenues – that it boggles the mind. However, you should always keep search engine optimization (SEO) in the mix. Optimizing your site with topics that are relevant, make it shine in the search engines. However, it also helps keep your marketing campaign on track when you use a variety of strategies. Word-of-mouth marketing, for instance, incorporates optimized content, as does social media marketing. It’s important you understand that not all of your marketing ideas will generate a profit. In fact, you might lose money at the start of a campaign. But as long as you know what factors to measure, you will be able to adjust your approach. When you find a winning strategy, you will make up for any money that you might have lost. With a little testing, you can quickly discover which marketing ideas bring in the most money and add them to your ideas for the win.